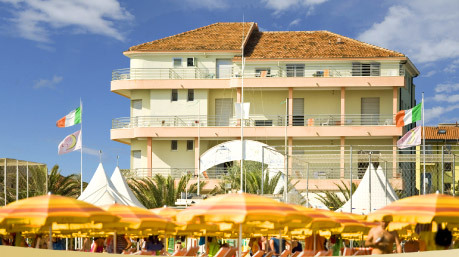 We are here to ensure your comfort and relaxation as you enjoy a memorable holiday in Rimini. Our accommodation comprises twenty triple roms and four double rooms. All have en-suite facilities, are well-appointed with colour television, safe and a hair dryer is also provided for your added convenience. Eight rooms have air conditionig. When dining, the Villa Mauri Restaurant enjoys nice views to the Adriatic sea . Our excellent Table d'Hôte incorporates local ingredients whenever they are in season. meets your every expectation at the very least - of all the forms of marketing, they believe this aspect to be the most important. For relaxation we have a comfortable lounge,were you can taste caffè espresso and a good cappuccino and the finest spirits. Our hotel , recently remodeled ,is situated in front of a pleasant coastal resort equipped with various playgrounds. The most part of the rooms have direct seaside wiew and spacious balconies. . Air conditioning in bar and restaurant . in 30 minutes Pesaro and Ravenna in two hours you can reach Florence and Venice. You can take advandatage of low cost carrier Ryanair landing at Rimini Airport from London and Frankfurt, only 19 km far our hotel. We are directly connected by bus to the new Rimini Fair Expo Centre. In a click you can choose you holiday!